This summer brought with it the recurrence of America’s fascination with all things Parisian. Actually, it is more than fascination and more like a deep romance which persists over time, only slightly diminished by the ebb and flow of diplomatic relations between the two great but, really, not so different U.S. and French republics. Woody Allen’s light-hearted and delightful new film, Midnight in Paris, offers a whimsical bit of time traveling by an aspiring writer, played by Owen Wilson. Wilson finds himself transported from present-day Paris back to the 1920s and into the milieu of American expatriate writers, including a hilariously over-the-top Ernest Hemingway (played with cartoonish zeal by stage veteran Corey Stoll). Intentionally or otherwise, Wilson’s performance approximates Allen in mannerism, speech and comic delivery. But Paris is the real star of the show. Not just the physical place but the cultural and historic ambience of the city, which has abounded in triumph and tragedy for centuries. Tragedy, searing tragedy, is the subject of the new French film, Sarah’s Key, based on the novel by Tatiana de Rosnay. It centers on the roundup of tens of thousands of Jews in Paris in July of 1942 by the French, not German, authorities. The English actress Kristin Scott Thomas (who is fluent in French and has been making interesting films in that language) plays a contemporary journalist who stumbles on a terrible secret implicating her French husband’s family in the horrible affair. The main plot revolves around the plight of the Jewish characters, both collectively and individually. This narrative, so infused with death, is interwoven with a symbolic counterpoint: a subplot on the tension between the Thomas character and her husband over an untimely pregnancy. The film’s setting in Paris, and the complicity of French authorities, is jarring given the beauty of the surroundings and the impression most viewers have of heroic French resistance to the Nazi occupation. 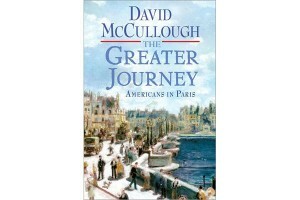 McCullough follows the odyssey of the second generation of Americans to visit Paris after Franklin, Adams and Jefferson. Starting in the 1830s, younger Americans, many but not all of them New Englanders, set a course for what was to become the City of Lights with the aim of improving their art, craft, or intellectual acumen. Not just painters but numerous medical students, sculptors, writers, politicians and inventors ventured to the cultural capital of the world. They were not pleasure-seekers, although they almost all succumbed to the charms of the Louvre, French food, and Gothic architecture. Even proud descendants of the Puritans were awe-struck after visiting the cathedral at Rouen on their trip to the city from the port of Le Havre or Notre Dame. They were all hard-working and dedicated to learning all they could, hours on end, for years at a time, from the masters to whom they attached themselves, be it in a hospital or an art studio. President Grant once said, “It has been a mystery to me how so many Americans can content themselves here, year after year, with nothing to do.” In this Grant was quite mistaken. Moreover, these eastern-bound pioneers were a most impressive group. Here, at random, are some of the American Francophiles whose stories McCullough tells in The Greater Journey: James Fenimore Cooper, Samuel F. B. Morse, Oliver Wendell Holmes, Charles Sumner, Harriet Beecher Stowe, Mary Cassatt, John Singer Sargent, Henry James, Henry Adams and George P.A. Healy. In addition, the book features portraits of Elizabeth Blackwell, the first female doctor in America; the New Orleans pianist and composer Louis Moreau Gottschalk; William Wells Brown, a fugitive slave and abolitionist writer; and George Catlin, painter of the Plains Indians who brought with him a band of Iowas and took by storm the court of King Louis-Phillipe. Throw in the successful tour of P.T. Barnum with Tom Thumb — also known as Charles Stratton, a five-year-old midget, two feet high, weighing sixteen pounds, who was a sensation on the Paris stage — and you get a sense of the richness and variety of McCullough’s story. David McCullough sustains his narrative in The Greater Journey through very dangerous times in the life of Paris — specifically its siege during the Franco-Prussian War and the uprising of the Paris Commune (the latter a bloodier occurrence than even the Terror itself). He maintains a seamless storyline by following the remarkable Elihu B. Washburne, the American minister in Paris and a former congressman from Galena, Illinois. Washburne’s Galena connection with Ulysses S. Grant earned him the job of Secretary of State, which he had to decline due to a bout of sickness. Despite criticism from some corners, Grant eventually did appoint him to the Paris post. His diary for those years of service is one of McCullough’s great finds, a real gem. Through war, insurrection, bloodshed and near famine, Washburne remained at his post in Paris while most of the diplomatic corps abandoned the city. He worked tirelessly to provide travel papers to stranded Americans and Germans, and provided as much humanitarian relief as possible to countless people. He even made an unsuccessful effort to seek the release of the imprisoned Archbishop of Paris, who was ultimately executed by the Communards. Washburne’s story alone compels the reading of The Greater Journey. “But coming here has been a wonderful experience, surprising in many respects, one of them being to find how much of an American I am,” said the sculptor Augustus Saint-Gaudens, who had come to Paris from New York City, penniless, at age 19. His monuments to Farragut and Sherman in his hometown, as well as his haunting monument to Henry Adams’ wife, Clover, in Rock Creek Cemetery in Washington, are just some of the creations which place him in the top rank of American artists. Saint-Gaudens’ belief in the salutary influence of Paris on his sense of his American self was not unique among his compatriots of that generation. They all shared a wholesome blend of patriotism and cosmopolitanism.